The Wollman Rink, located in Central Park and made famous by many movies, is a fantastic place to take the kids for the day during the winter months in New York City. The setting of this ice rink is beautiful, surrounded by trees with the New York City skyline above them. Children can even attend skating school while adults can host a party or event, guaranteeing an unforgettable experience. 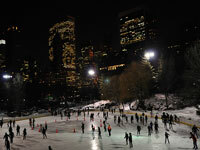 The rink is not just for children, however, and is a popular spot for dates in New York City, due to the romantic associations and stunning setting. Opening times: Public skating hours can vary throughout the year, and the rink is only open seasonally. Admission: Monday to Thursday: $12 (adults), $6 (children under 11). Friday to Sunday: $19 (adults); $6 (children under 11).